Addison Agen, Chloe Kohanski, Red Marlow, and Brooke Simpson advanced to the Season 13 finale. Addison Agen, 16, is one of the youngest finalists. Her audition song was “Jolene” by Dolly Parton. She sang this song with emotional vocals. Adam Levine and Miley Cyrus were impressed, so they turned their chairs for her. “Addison, you’re one of my favorite singers… One of the most talented people since Danielle Bradbury. You’re one of the most talented people we’ve had at any age. I’m your biggest fan,” Levine commented. Miley Cyrus added that she can relate to Agen because she has also experienced heartbreak. To add, Cyrus heard the cracks in Agen’s voice. “I’ve had cracks in my voice since I was 16 years old,” Cyrus added. Levine and Cyrus saw her potential as a singer and performer. Initially, Agen was a singer on Team Miley. After receiving a double steal, Agen is on Team Adam. She advanced to the finale after singing Joni Mitchell’s “Both Sides Now”. Agen sings with sentimental and emotional vocals as the orchestral strings harmonize with her vocals. Now, Agen’s semifinals performance has 569k YouTube views. Chloe Kohanski, 23, sang Fleetwood Mac’s “The Chain” during her audition. Her signature strong, raspy, rock n’ roll vocals stood out. Miley Cyrus, Jennifer Hudson, Blake Shelton turned for Kohanski during the audition. Kohanski is from Tennessee and loves the sound of psychadelic rock. Blake Shelton accurately predicted that Chloe will be in the finale. He also commented that Kohanski has a unique sound. “I love the lower register… my favorite was when you opened up. Your voice cracked, shredded… I would love to have you on my team so bad,” Shelton said. Jennifer Hudson added that Kohanski has a stage presence and power. “Your vibe is so cool… Made me want to be your friend… Your presence and voice… I saw a superstar. I feel the connection,” Hudson added. Initially, Chloe Kohanski was on Team Miley. 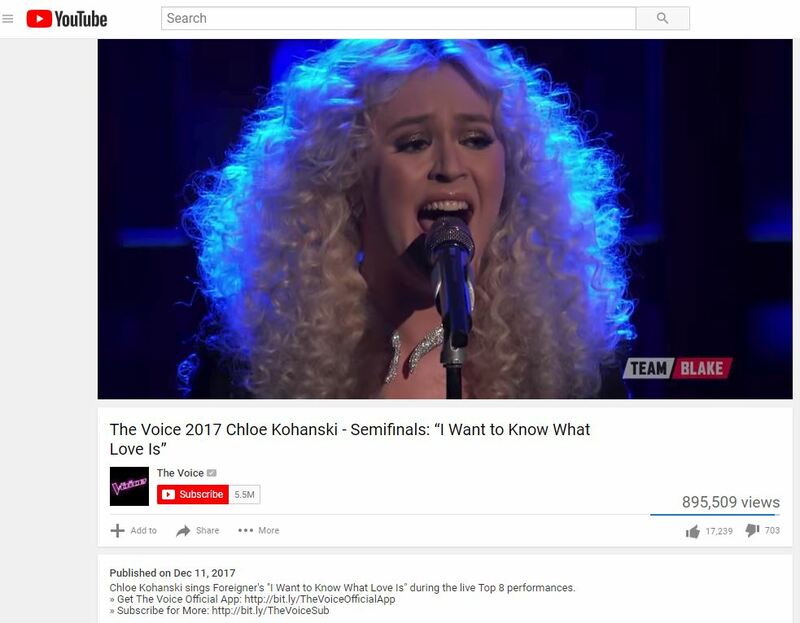 Now, Kohanski is a singer on Team Blake. Kohanski advanced to the finale after she sang Foreigner’s “I Want to Know What Love Is”. This performance received 895k YouTube views. Kohanski belts out the words to the upbeat, contemporary pop track as the acoustic band harmonizes with their instruments. Red Marlow sang “Swingin” by John Anderson during the Blind Auditions. Miley Cyrus and Blake Shelton turned for Marlow, who is from Alabama. Marlow’s audition has 1.1M YouTube views. Marlow talked about the first time he met Shelton in Alabama. “Does everybody know each other in the South?” Levine asked. “A little bit,” Marlow responded. Then Levine asked Shelton how many people he knew. Blake said he knows everybody. “To have a guy like you that wants to represent country music from ear you and I grew up in… That’s exciting to me. I would love to see you get the opportunity you deserve, man,” Shelton commented. 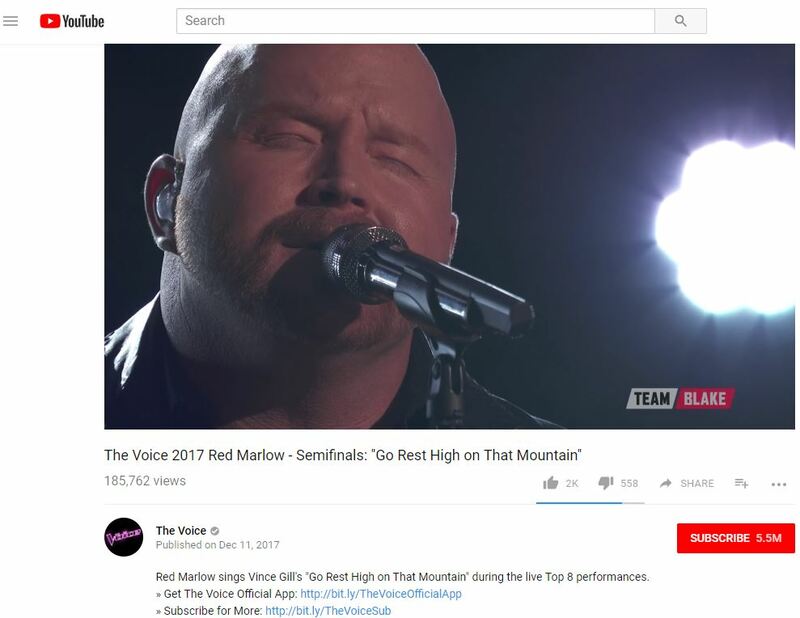 Red Marlow is on Team Blake. His unique country sound shows in each performance. Marlow advanced to the finale after singing Vince Gill’s “Go Rest High on That Mountain”. Red’s strong vocals were accompanied by soft strings and backup singers. The white lights and black background matched the emotional mood of this song. Marlow’s semifinals performance has 185k YouTube views. Brooke Simpson is this season’s first four-chair turn. Simpson is featured in an article including singers who received four-chair turns. For more information, click here. Simpson was the last performer in the first episode. Simpson sang Demi Lovato’s “Stone Cold” with powerful vocals and emotional depth. Simpson received a standing ovation after her soulful performance, which has 5.2M views. Brooke Simpson said that she is mainly inspired by her mother. All coaches agreed that Brooke is a special artist. Adam said that Simpson’s ability to sing soulfully with proficiency and power is hard to find. He added that Brooke could potentially win the competition. Also, Cyrus predicted that Brooke would win on her team. Brooke Simpson is a singer on Team Miley. 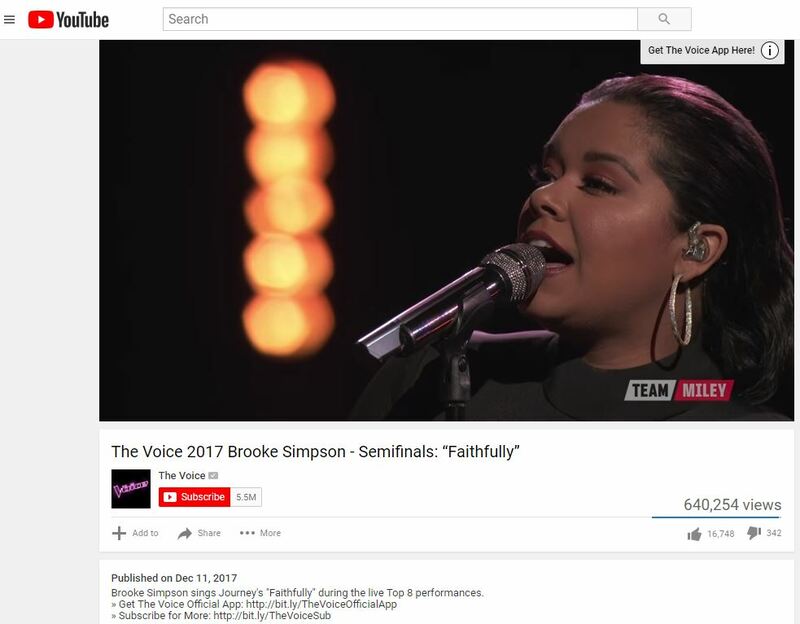 Brooke Simpson advanced to finale after singing Journey’s “Faithfully”. This lively performance features acrobats and backup dancers. Brooke’s powerhouse vocals shine as she sings to piano accompaniment in beginning. The guitars and drums build up after the first chorus. 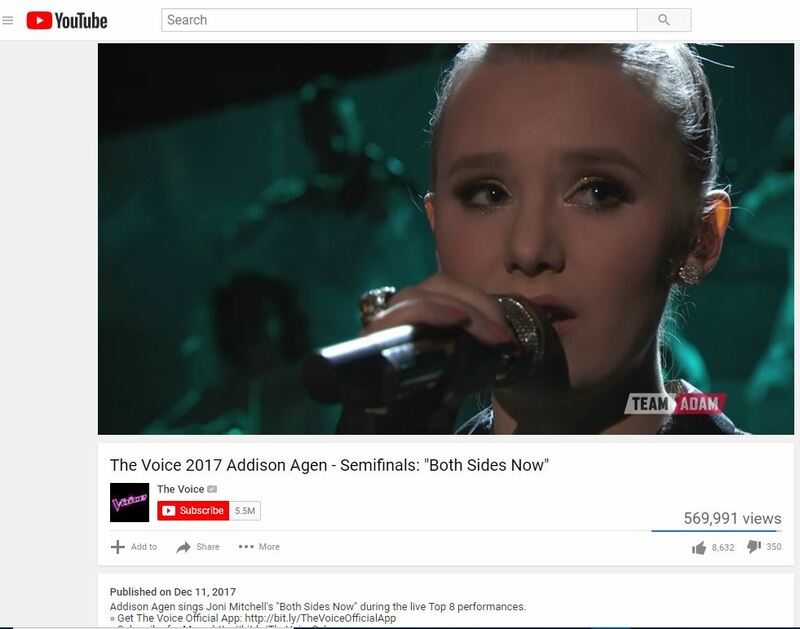 Simpson’s semifinals performance received 640k YouTube views. The Voice’s season 13 finale will broadcast live at 8/7c on NBC. The winner will be revealed on Tuesday, December 19. Who will win season 13? Vote in our poll below.